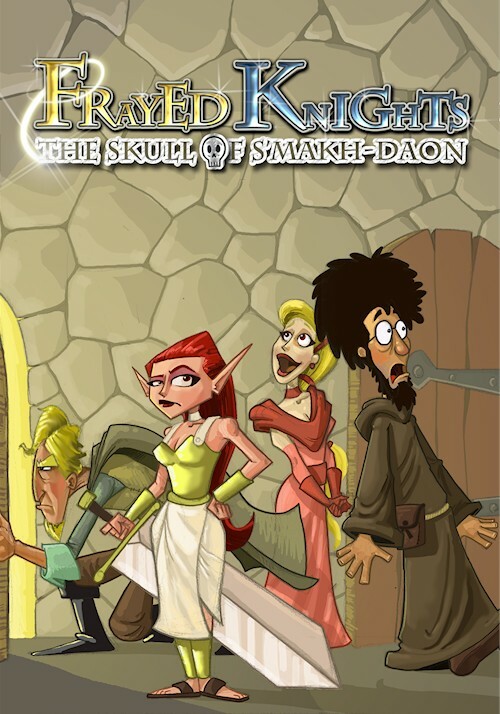 Frayed Knights: The Skull of S'makh-Daon is an upcoming indie RPG from developer Jay Barnson, a name you might know for the candid and insightful RPG commentary that he often posts to his blog. He has been working on Frayed Knights for quite a while now, and eventually realized it was getting too big for a single release, so the Skull of S'makh-Daon is to be the first of three titles. Barnson provided GameBanshee with a beta copy and then a release candidate copy to play around with, and I had just found the Skull of S'makh-Daon after about 6-7 hours into the game when I figured I'd seen enough for a quick preview leading up to a likely release tomorrow. Frayed Knights is an old-school, turn-based, first-person RPG, with the focus of the game being dungeon crawling in the most classic sense: fighting through monsters, disarming traps, and finding your way past magically locked doors. There isn't a whole lot of puzzling and none of the quests are particularly complex, usually exploring a dungeon fully is enough, but the game lacks that annoying modern staple, the quest marker, so you do have to pay attention and solve things yourself. A few quests take place only in town, by talking to various townspeople and solving their (often very minor) problems. The game seems fairly linear, though you're free to decide in what order you want to explore dungeons and solve quests, and occasionally are offered a few choices on how to approach a problem. The player takes control of a party of four: Arianna, Dirk, Chloe and Benjamin, following the staple of warrior, rogue, sorceress and priest. There's no character creation or customization at the start, and the characters are always represented by the same portraits. The character system is fairly complex, with upgrades divided over attributes, enhancements, proficiencies, skills and spell-casting, which provide a variety of passive enhancements, fulfilling item requirements and providing active combat skills and spells. There's a good variety of items, weapon types that interact with weapon skills well, armor with disadvantages for the non-warrior types, supportive items for spellcasters (wands, scrolls, gems). It's a good and seemingly well-balanced system, though obviously I didn't test it to its limits. You can upgrade any character as you like, but the game is built to encourage to stick to the character's specialization, so you'll want to focus Arianna mostly as a brawler, and Benjamin as a supporting spell-caster, but you can get creative with some secondary skills. The system is certainly expansive enough where RPG fanatics can puzzle with skills and proficiencies and specific items to optimize their characters, but on the other hand, I just jumped in with no preparation, and the game isn't so complex as to make that style of play impossible. The very earliest combat is pretty simple, just pressing (a) for attack to win the first few fights, but it doesn't take long until the game starts throwing tougher opponents at you, and spellcasters that buff their allies and cast blindness and sleeping spells on the heroes. Simply attacking and casting direct damage spells isn't the right way to go, sleep/stun/blindness spells are a great help in fights, as are buffs and other supportive spells. It's easy to grow some favorites (I am particularly fond of tryptophan, deep fat frier and fade attack so far), but you have to adapt your tactic depending on your opponent and the state of your heroes. The two big stats to keep an eye on during fights and while exploring are health and endurance. When health runs out, the hero is incapacitated and unless you spend a potion or drama stars (more on that later), he/she will be out until you find time to rest in the local inn. Spells and skill provide healing during and between combat. Endurance is a catch-all stat for fighting stamina and mana. Whether you just attack or cast a spell, it always costs endurance, though how much depends on the level of the spell or special attack. You can take breathers in combat, and between fights you can rest anywhere in the game world, but if you do so you run the risk of being attacked by wandering monsters, though in my personal experience so far this isn't a huge risk, and in-dungeon resting is very useful. While you travel each fight creates exhaustion, which caps how much endurance you can regenerate by resting. When the exhaustion level becomes too high, you've got no choice but to quaff potions, use one of the rare endurance-healing opportunities in dungeons (I've seen only one so far) or return to town to sleep.